And so in the world of 'Too Like the Lightning', in the middle of the 25th Century there are no proselytizing religions. Belief is purely a private matter, for discussion of the individual with their counsellor (sensayer). Three people, meeting together and talking of God constitutes a Church meeting, and is proscribed by law. The 'Church Wars' saw to that. Nation states are no more, with humanity affiliated instead into seven Hives of the like-minded, whose globe spanning clans have also replaced the nuclear family with the bash'(from the Japanese i-basho), groupings of four to twenty friends, rearing ideas and and children together in their private havens of discourse and play. Masons, Humanists, Gordians, Cousins, Utopians, Mitsubishi, Europeans and the Hiveless all have a role to play. Fundamental to the function of the world is the existence of cheap, rapid and reliable transport. The Mukhta, the really truly flying car connects the world and obliterates distance. one can live in Chile, work in London, and be home in time for dinner. The Saneer-Weeksbooth bash' has the responsibility for maintaining and controlling the system which manages the cars. Hundreds of millions of lightning fast transits every day. They are the most important people in the world. There is a lot to like here. 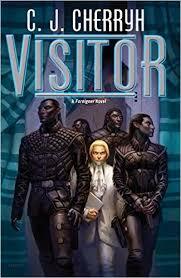 The story is new and inventive, and after initial orientation, the tone of the narration works well. It is rare to find a story of utopia, rather than the dime a dozen dystopias which are the currency of near future fiction these days. Of course, below the surface, perhaps it is not so perfect after all. I did however, find it hard to comprehend why the 'Seven-Ten List', even if stolen could be of much consequence, given that these lists are the opinions of a journalists and commentators. Whilst the world is well conceived, it focuses exclusively on the lives of the elite and influential, without giving a glimpse of how the ruled pass their lives. And, perhaps not surprisingly, since the Enlightenment is largely a European idea, it is overly Eurocentric. Africa and South East Asia seem to have disappeared, whist the Mitsibushi hive is seemingly the ghetto for inscrutable orientals. 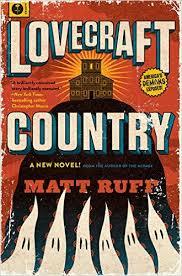 ​Matt Ruff draws his readers into a different kind of alien world in 'Lovecraft Country'. It is the alien world of Jim Crow America, barely 70 years past that will be unfamiliar to many, and repressed from memory by others. It is different because that world reallly existed. This vividly realised world is overlaid with elements of Lovecraftian horror, covens of sorcerors battling each other for dominance, stolen magical books, portals to distant planets, haunted houses and poltergeists, disastrous magic rituals, plus plans for revenge and redemption. That the heroes of the story are African Americans, even African American women might have that misogynistic old racist Lovecraft spinning in his grave is an added pleasure. 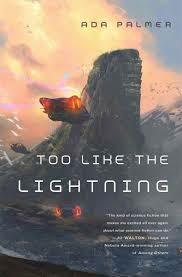 Most of all it is the story of a the extended Turner/Green family as they make the best of a difficult world. It would be hard enough to make ends meet if one only had to deal with corrupt policemen, prejudiced and discriminatory laws and irrational fears of frightened and ignorant white folks and their all too knowledgable leaders. Finding that ones ancestors are descendents of powerful warlocks, who need their blood, and are not particularly concerned whether they survive its extraction does not make for a happy life. How they come to deal with the challenge makes for a real page turner. It is eligible for the Hugo award in 2017, and goes straight on to my longlist for best novel. This sequel can be read well enough as a standalone. There is sufficient backstory recapitulation provided to make a pre-read of 'Something Coming Through' unnecessary. I think it is a stronger book than its prequel, with tension and mystery held throughout, and with a plausible and satisfying resolution. 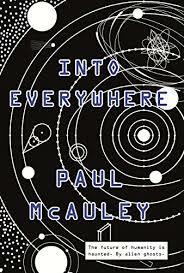 McAuley creates a deliciously eerie atmosphere, particularly with his worldscape descriptives, be it the strip mall encumbered deserts of First Foot, or the melancholy dankness of the eternally rainy streets of Tanrog, the only city of waterworld Veles. And he has learned the lesson of the Heechee, that the chase is most often more satisfying than the unveiling. This one is on my Hugo longlist for 2017. The 17th book in CJ Cherryh's Foreigner series kicks off immediately after the closing events of its predecessor 'Tracker'. A semblance of peace has been restored to Alpha station as it orbits the Earth of the Atevi. Bren Cameron is rid of the troublesome human stationmaster Tillington, and Braddock, putative leader of the restive refugees from Reunion Station is in atevi custody. Human associates of the heir to the leadership of the atevi, the young gentleman Cajieri, are safe after their misadventures. Not ideal, but manageable. The kyo starship continues to approach the space station. For talking, or perhaps for less desirable actions. This latest installment draws heavily on backstory from the the series. In particular it draws on the events of 'Explorer', and just what happened at Reunion and why. Complicated of course in that many of the protagonists are dead, and records are lost or locked away. The tension builds as the arrival of the Kyo ship becomes imminent. If something goes wrong, there is no escape here. There are the distraction of human and atevi politics to consider. Bren Cameron muses on how he became paidhi, and the changes that he brought to the role, all the while desperately boning up on what little kyo vocabulary was accumulated back at Reunion. How accurate is the story he knows? The tension is maintained as the kyo arrive, and through the taut negotiations between kyo and atevi and paidhi. The process of deciphering a language from first principles is unpicked and is fascinating. What role do facial expressions hold, and what information is imparted by what cannot be heard?